Enjoy delicious food and drink at Maruzen Takizawa Shoten, Hakodate’s standing tavern in the local Kitakyushu area! Enjoy The local taste and a delicious drink at this stylish adult destination! 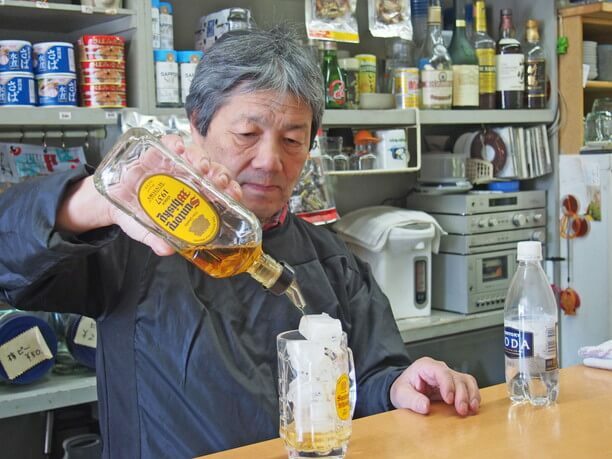 The “Maruzen Takizawa shoten” is a standing drink counter tavern that is easy to get to from the Hakodate station. 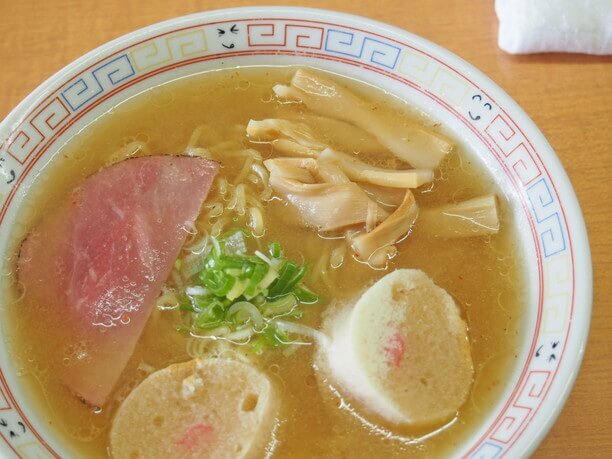 It is open from 10 o’clock in the morning, and has menu items such as ramen and udon, so you can visit for a light meal. 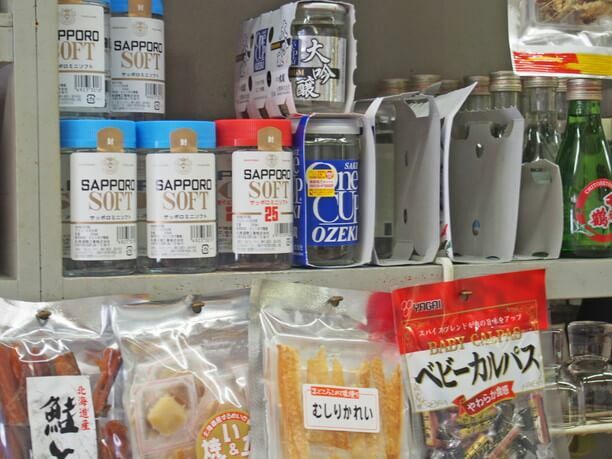 There are 55 yen rice crackers and canned items in the shop, and plenty of other cheap homemade menu items. With its ease of access and great prices it is a popular local hangout! From 10 o’clock in the morning you can drop in for a light meal! This shop not only attracts plenty of local people, but is also loved by out of town businessmen and travelers. 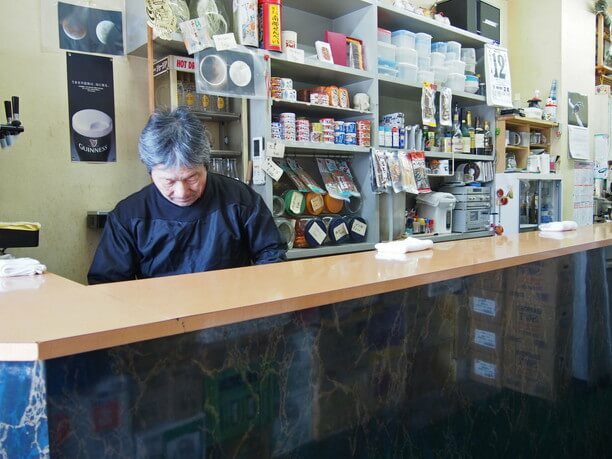 Their principal business is as a liquor store, but the counter service is frequented by many! It is also popular for people who like to eat light meals during the day. Their specialty is their salty ramen (300 yen). It has chicken noodles that go well with the soup that uses chicken as a base. The recipe includes cooked bamboo that is plentiful and crisp. It is topped with ham and Osaka. Cheap! You can eat and drink with one coin! 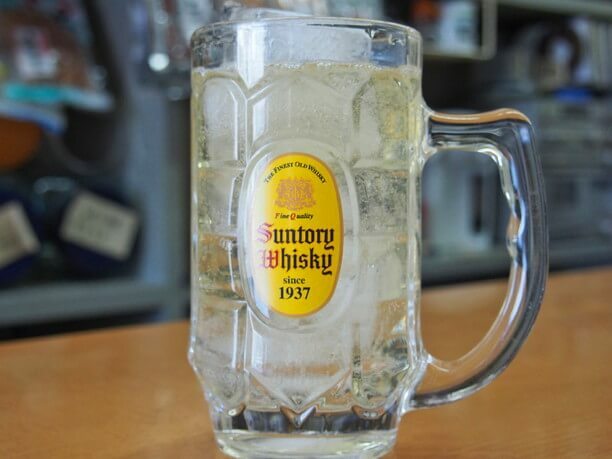 They also serve a from the bottle Kaku high ball for 220 yen and a pre-mixed canned high ball for 240 yen. The owner, Hiroshi Takizawa(瀧澤博), tells me that he serves his own special dishes at the shop that are aligned with his grandfather’s standards. 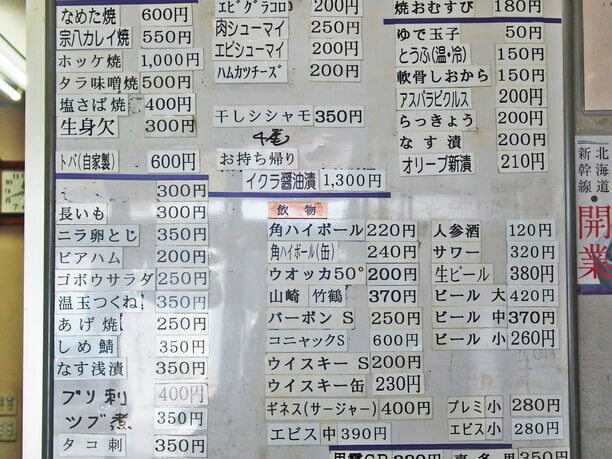 If you order the high ball (220 yen) and ramen (300 yen) together, the price is 520 yen, If you order soba buckwheat or udon both 250 yen each, your price with the highball will be 470 yen. 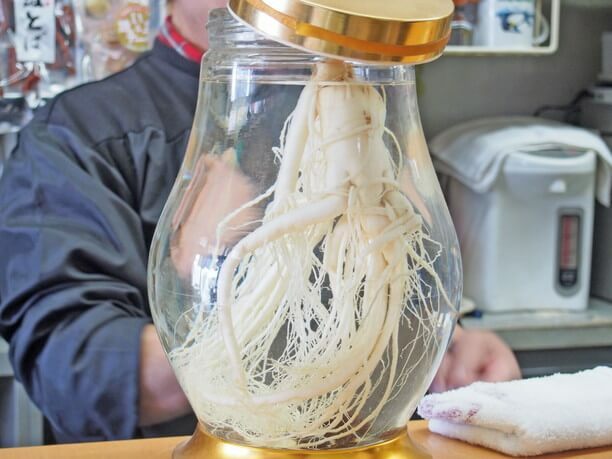 You can have ginseng in a shot glass for 120 yen. It will awaken you from the tiredness of your trip. Their handmade salmon Toba is soft and juicy! There are plenty of items on the menu, all of which are surprisingly cheap. They use seasonal seafood and prepare it with fresh ingredients. 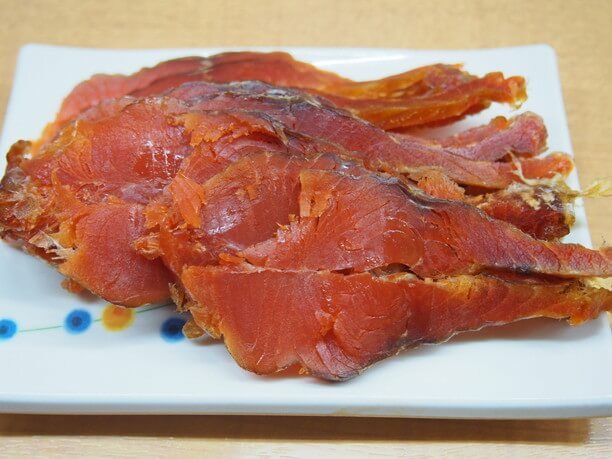 Particularly popular is the homemade salmon Toba (600 yen). It is much softer than the salmon in the market and has a rich taste that goes well with their sake. 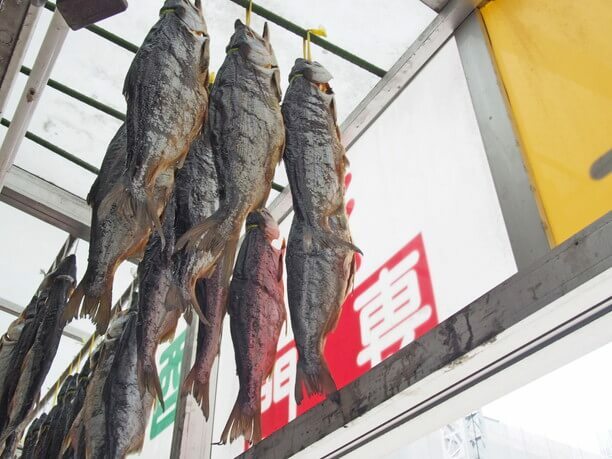 There is dried salmon lined up in the eaves of the shop. 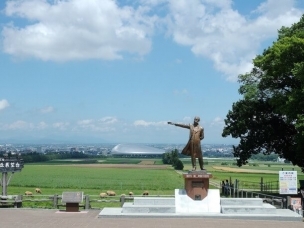 It is a common scene in Hokkaido! 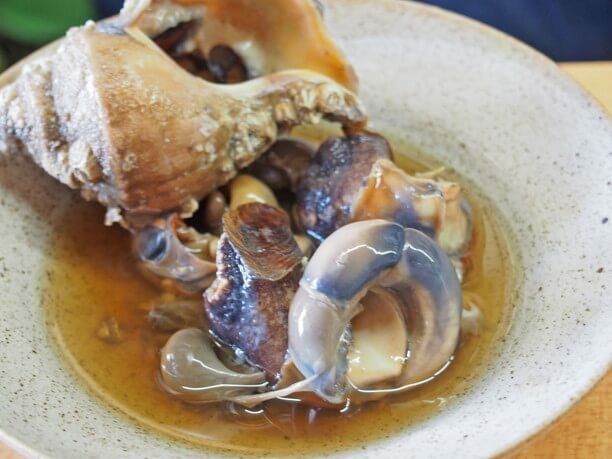 Also quite popular is their stewed shellfish (350 yen). It is already removed from the shell which makes it easier to eat. It is a dish offering soft texture and gentle flavors that are delicious! 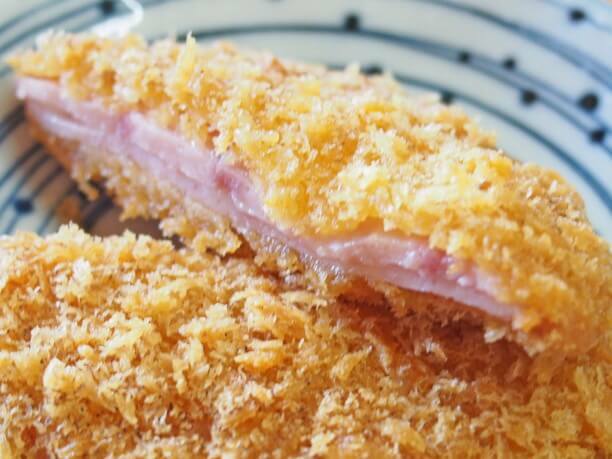 Also available are ham cutlets (200 yen), that you can eat with freshly fried eggs. 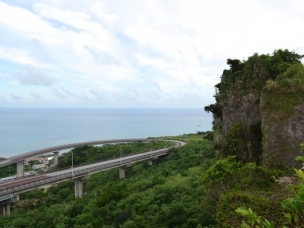 Located close to Hakodate station! Maruzen Takizawa Shoten is about a 3 minute walk from JR Hakodate Station. 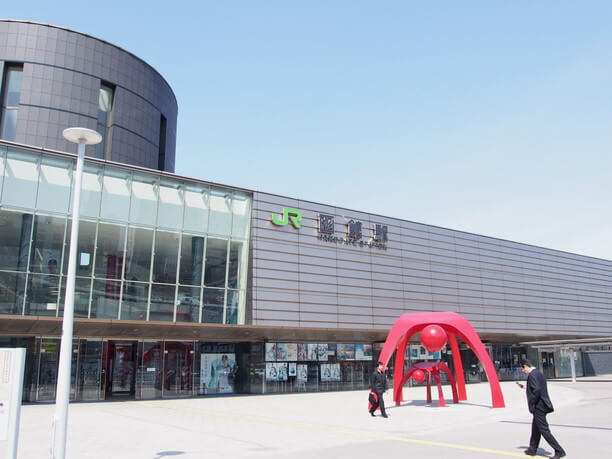 It is a convenient place to stop when sightseeing in the area around the station such as Hakodate morning market and the city streetcar. When leaving the JR Hakodate Station you cross the traffic lights at the bus roundabout, and you will see the Fuji glasses building on your left. If you turn left at the corner, you can see the sign of ” Sake no Maruzen,” after around 60 yards. 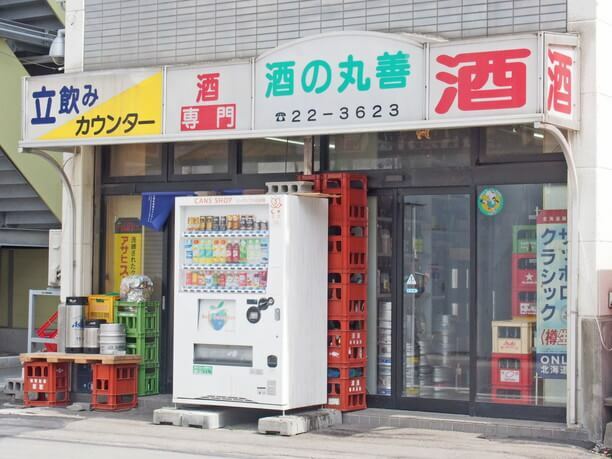 The liquor store is on the right side, and the standing drink counter is on the left side. There are two counters in the shop, and it can hold more than 20 people. You pay every time you order rather than adding it to a tab. 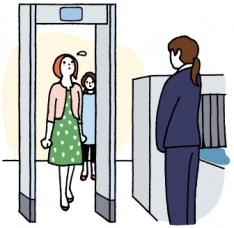 Some customers leave thousand-yen bills out on the counter and have them take it out of that. An enjoyable place for a drink and good conversation! The owner is a good listener so many regular customers like to tell him their story, while they enjoy one of his delicious meals. Snacks using northern seafood make for a delicious treat. There are many seasonal items handwritten on the whiteboard. If you are a beginner at standing and drinking, we recommended coming a little earlier when it is less crowded. In the evening there are many locals around to talk about things to enjoy in the city. Cigarette smoking is not allowed in the shop! They also have a place where you can hangs your bags. You can spend your time quietly drinking or engage in conversation with the owner and the locals. 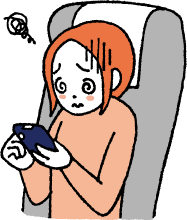 A One thousand yen bill is enough to get you several drinks. It is a great place to drop in when you are near the Hakodate Station and have a little time to spare. 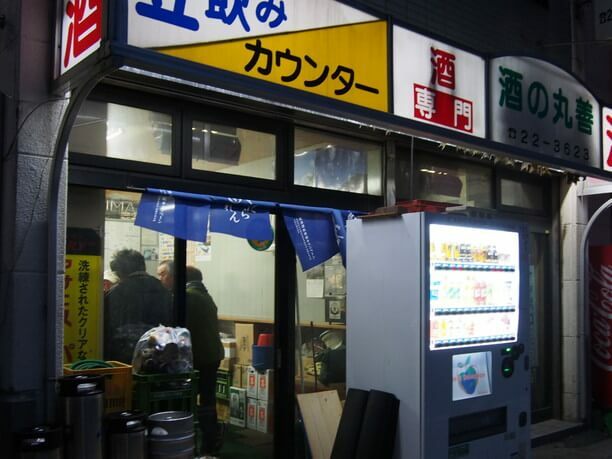 Enjoy the popular “Ajito,” a standing drinking shop in the Ura Nanba section of Osaka’s Minami area! Enjoy the taste of Northern Europe’s delicious bread at B’s Kafe’ fancy space! Madoka is a”Japanese restaurant that buys ingredients from local producers! Enjoy delicious sweets and Happy feelings at the Patisserie Salon Dor.